Today EURUSD is chiefly under the influence of the Italian referendum which put EUR under pressure. 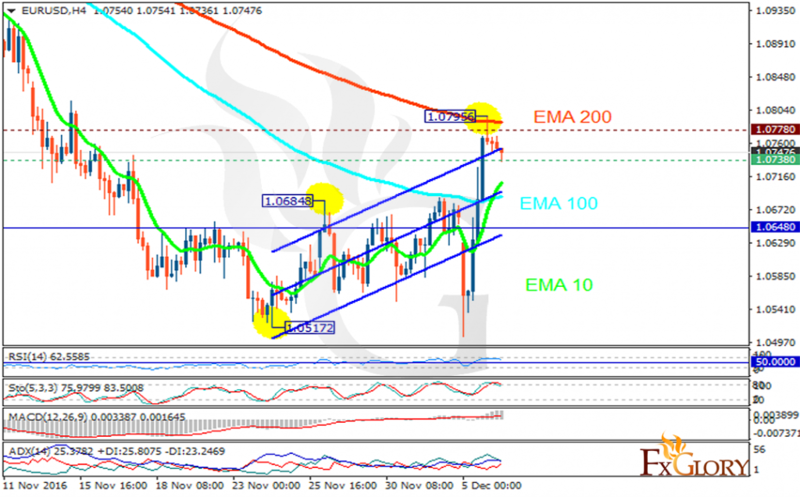 The support rests at 1.07380 with resistance at 1.07780 which both lines are above the weekly pivot point at 1.06480. The EMA of 10 is moving with bullish bias and it has crossed the EMA of 100 but it is below the EMA of 200. The RSI is moving in overbought area, the Stochastic is moving in high ranges and the MACD indicator is in positive territory. The ADX is showing a weak buy signal. Buyers can wait for 1.0800 for their next target.